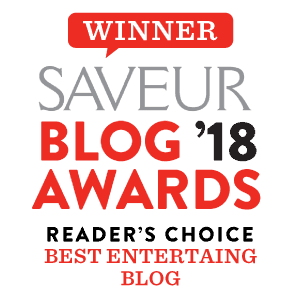 The first spring recipe that always comes to mind for me is Carrot Cake and QUICHE! 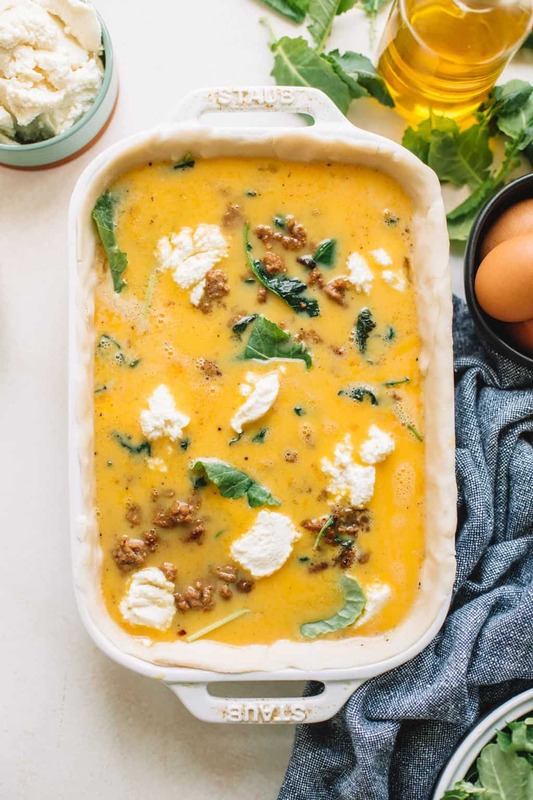 This easy sausage, kale and ricotta quiche is perfect for spring brunches, Mother’s Day and of course Easter! 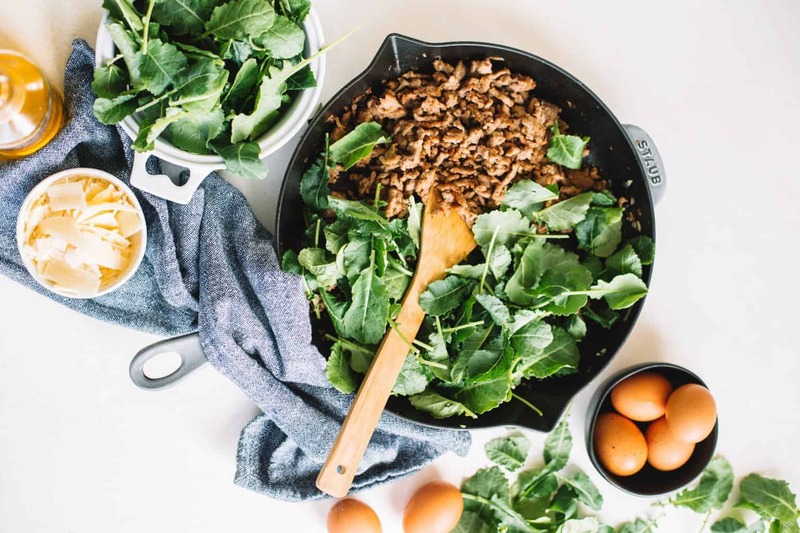 It’s a simple quiche recipe filled with savory turkey sausage, rustic & organic Taylor Farms baby kale and creamy ricotta cheese. 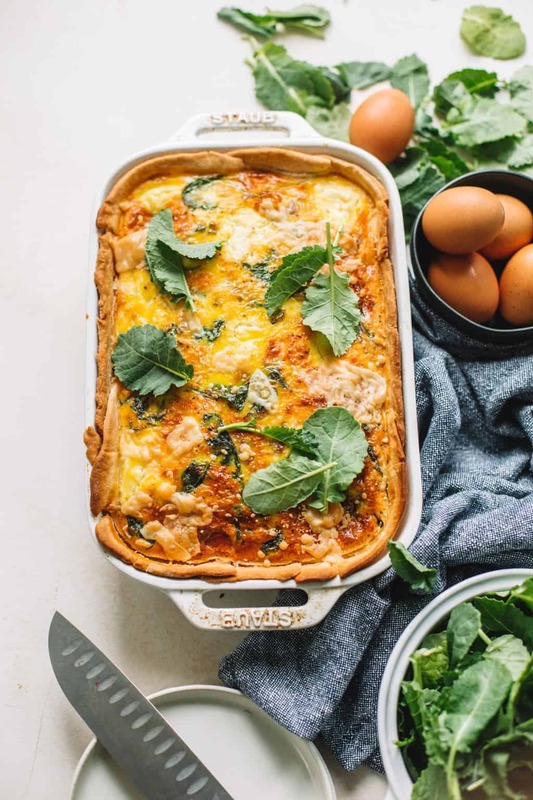 You can make this quiche the night before for a quick morning brunch! A big thank you to Taylor Farms for supplying us with great ingredients and keeping The College Housewife up and running! It is officially APRIL! Oh my life I could not be more excited! I thrive in the warmer months. I started this first spring weekend off by spending far too much money at Home Depot on plants and gardening supplies. I don’t really have any good excuses for myself other than veggies and herbs were 5 for $15 dollars and that was reason enough to buy about 50 of them to spread across the backyard. Yes, I realize this is probably ambitious but I got a little too excited to fill my herb garden planters back up and try out some new veggies like lemon cucumbers, honey dew and strawberries! Yes, I did indeed have to google how to grow all of these. If you have been following along my insta stories you know I have been spending every spare moment trying to get the backyard into commission. Saturday and Sunday I pretty much forced myself to spend the entire day outside and it was amazing. Jared and I broke for some lunch at 1pm each day and played a few rounds of Gin (it’s kind of our new thing). It’s a really basic card game that doesn’t last forever and keeps my attention. We play best out of 3 hands and go on with our night or day. On Saturday we had my parents over for dinner in the backyard for the first time this year, which was just so pleasant. I made this easy salmon with bursted tomatoes, garlic mashed cauliflower and roasted broccolini. The best part of the whole weekend was our furry house guest running around. Our friends, Sierra and Evan left us there English cream retriever, Quinn, for the weekend (aka Rascal’s girlfriend) while they went to a wedding. Needless to say we were just so excited to have her! She played in the backyard with Rascal all weekend and she is just so sassy and fun. I can’t wait till we get a second pup for keeps! This weekend honestly felt like what my life would resemble when I was retired and I was mildly in love with it. I hope when I’m older I’ll have a house similar to Meryl Streep’s in ‘It’s Complicated’, have you seen this movie?! If you haven’t, you should! I know you would love it! 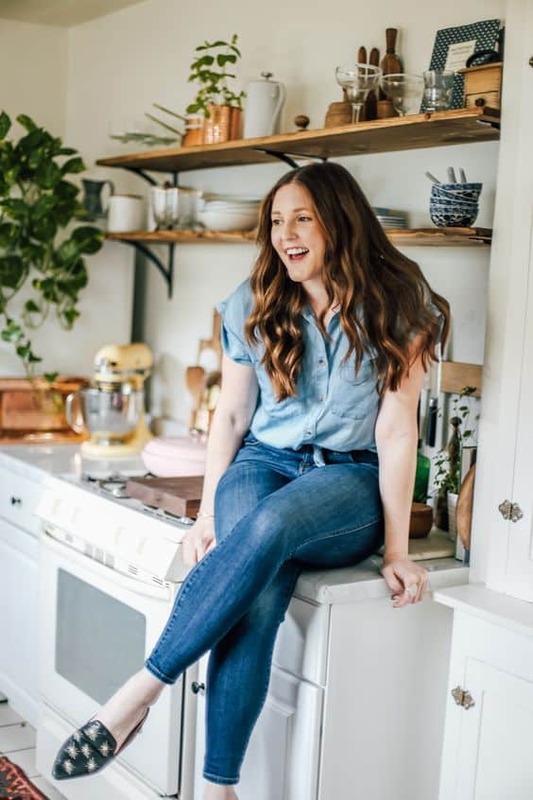 Along with my house getting a small spring makeover, I figured it was high time to start posting some fun spring recipes! I look forward to trying as many quiche’s as I can during ‘brunch’ season (ya know Easter, Mother’s Day, Bridal showers, etc). Quiche is just so easy and delicious. I don’t ever remember having a ‘bad’ quiche. You can eat it a room temp or right out of the oven. It’s usually light and airy but still some how fills you up. 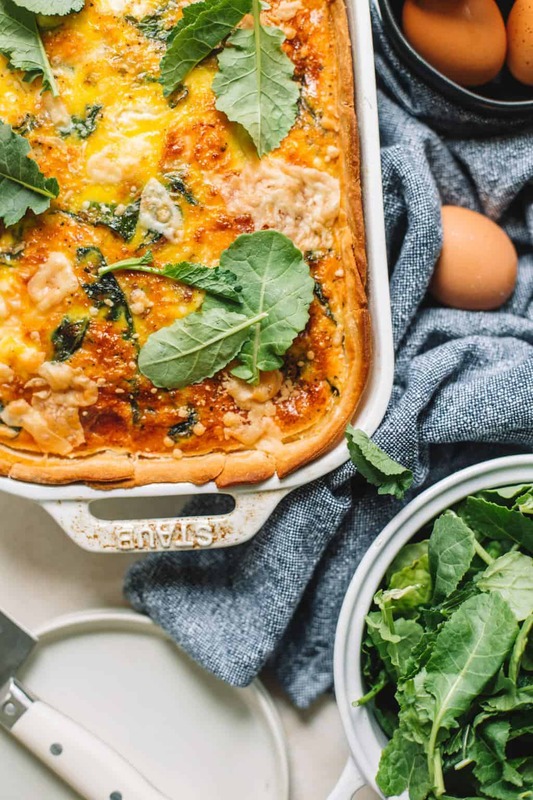 Pair this sausage, kale and ricotta quiche with a mimosa and you’re morning is SET. Now, let’s talk about flavors. There are probably a million and one different quiche’s of the ‘ham and cheese’ variety, which is very tasty but… a little played out. I was determined to do something a little different that would leave people saying ‘wow this is tasty what’s in this? !” ya know?! I swapped out ham cubes for ground Italian sausage and cheddar cheese for creamy ricotta. 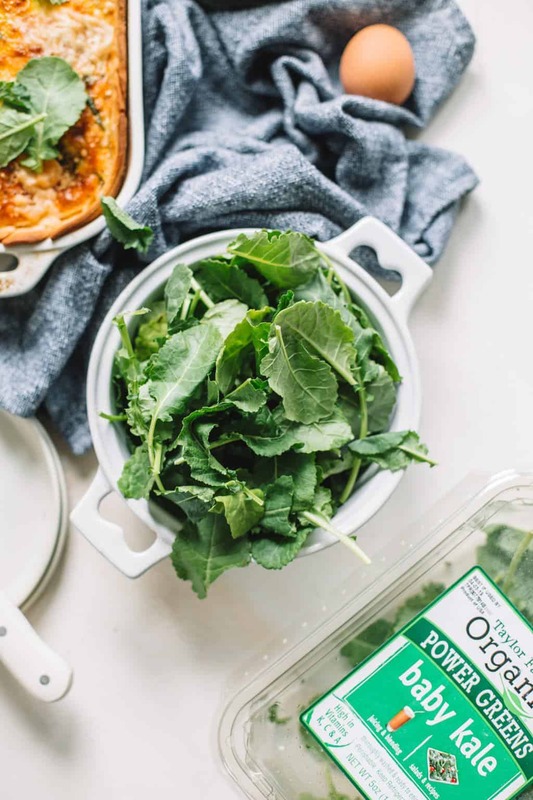 To give everything a bright, spring touch I added in a few cups of Taylor Farms Organic Baby Kale. When I’m making brunch dishes for a crowd like this I always try and skip as many steps as I can. Using rinsed, ready to go Taylor Farms Baby Kale saves me time and I know the ingredients I use will be top quality. Also, store bought pie dough is a life savor for something like this. If you’re feeling ambitious, you can certainly make your own pie dough. 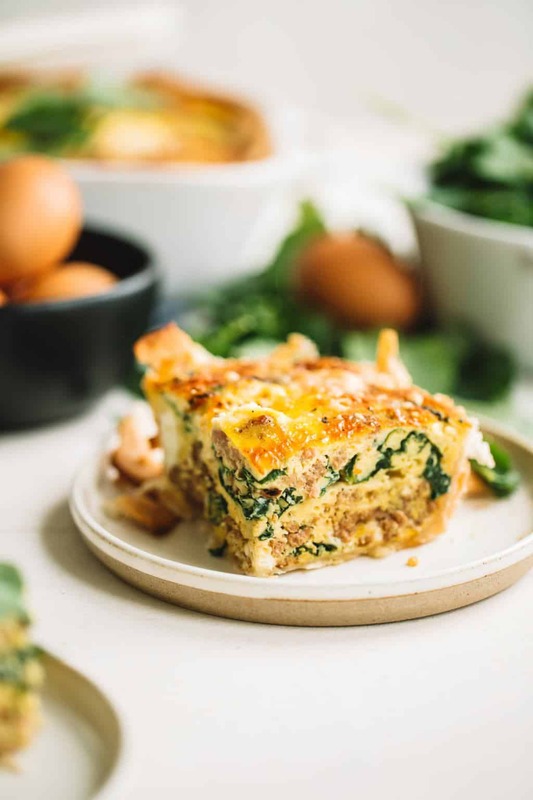 You can still make this quiche the night before, it’s a great recipe for a crowd and yes, will totally be amazing on your Easter brunch menu! Preheat oven to 400 F. Line a medium sized casserole dish (9x13) with two pie dough disks. Trim and crimp edges. Heat a medium cast iron skillet with olive oil on medium heat. Add in turkey sausage and cook for 8-10 minutes, stirring frequently, until cooked through. Add in kale and stir together with sausage. Add in 2-3 tablespoons of water and place a lid on pan for 2 minutes. Kale will steam and wilt. Stir together once more and remove from heat. 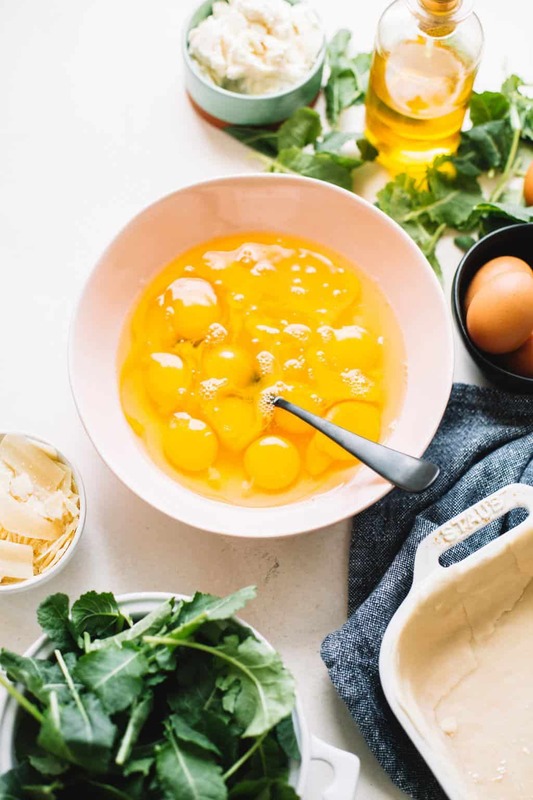 In a large bowls whisk together eggs, half and half, salt, and pepper. Gently stir in kale and sausage mixture. Pour egg mixture into prepared dough lined casserole dish. Dollop egg mixture evenly with ricotta cheese. Bake quiche for 45 minutes. Remove from oven and top with parmesan cheese, and return quiche to oven. Bake for an additional 10-15 minutes or until the top is golden brown and the middle of the quiche has just set. Cool for ten minutes before slicing and serving. Can be made the night before, cover quiche tightly with plastic wrap and bring to room temp before baking.